Facebook Messenger is a very robust application that allows you to chat with all of your Facebook friends and even contact people who may not be active on the social network. There are several ways that you can add people to your contact list, and this article will walk you through each of them. Perhaps the most basic way to add contacts on Messenger is through Facebook, itself. Log into Facebook via Messenger, and then do a search for new friends using the Search field. Once a friend has been added, they will automatically be added to your Messenger contacts list. Another method that you can use is to add a contact by their phone number. To do this, sign in to Facebook Messenger and select the People tab. If the user is not yet active on Facebook Messenger, tap Invite them to join to send a chat invitation. Another way to add contacts to Messenger is to sync the application with your phone. Launch Messenger, and select the People tab. Then, press Sync contacts > OK.
You will need to give Messenger access to your contact list. Android users can do this by clicking Approve. iOS users will be redirected to their General Settings, where they can simply toggle the Contacts option ON. Once the sync is complete, you will see a list of new contacts. Published by deri58. Latest update on October 12, 2016 at 12:04 PM by Olivia Long. 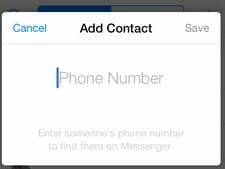 This document, titled "How To Add a Contact on Facebook Messenger," is available under the Creative Commons license. Any copy, reuse, or modification of the content should be sufficiently credited to CCM (https://ccm.net/). Facebook Messenger - How to send voice messages?